The “Creeks of the North Fork” float won first place in the Polebridge 4th of July Parade this year. The first place prize, donated by the Merc and the Saloon, was $100 to spend at the Merc or Saloon and $100 to be donated to whatever non-profit organization the group chose. 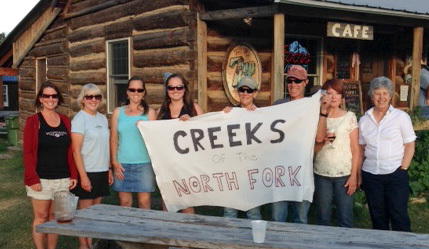 “Creeks of the North Fork” spent their prize money on a pizza party on Friday night. The group decided that the $100 donation should go to a North Fork non-profit organization. After some discussion about which organization, they reached consensus on the NFLA Improvement Fund for Community Hall Maintenance since having use of Sondreson Hall benefits everyone in the North Fork. Most of the 18 members of the float attended the pizza party (although not everyone was present when the picture was taken).